Compared to Avengers, the Guardians of the Galaxy series is one of the lesser known Marvel Comic’s series. But, that all changed since the film released in 2014 and became a hit. The comic book series gained a lot of popularity, and the characters became more well-known. The sequel, released in mid-2017, brought in a few new characters, but also drove home everyone’s love for the ones we met in the first movie. The success of the movies, with both adults and children alike, resulted in great Halloween costume ideas. Below I discuss some of your options when it comes to the Guardians of the Galaxy costumes. Since the characters are very diverse and easily distinguishable from one another, people will not mistake you for something else. The most common among the Guardians of the Galaxy costumes is Peter Quill, or Star Lord, the protagonist of the movie. Even without buying a ready-made costume, you can easily recreate his costume yourself. He wears a red leather trench coat with leather straps running across the chest and leather shoulder pads. Finish off with black pants and black combat boots and the only thing you need to find is a metal mask with red eyes as well as a futuristic space pistol, both can be found on Amazon.com. If you go for a ready-made costume, you can easily find them in both kids sizes as well as adult sizes. 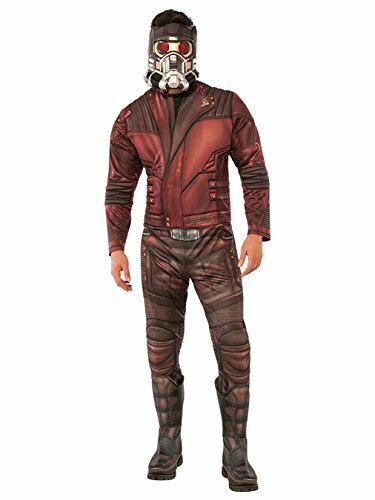 If you want to reuse this costume in the future, I would spend a little more and buy one that has a better quality, so you can use it next year, or go to comic-cons dressed up as Peter Quill. Other popular characters are Groot and Rocket Raccoon. Groot is a created made of wood, a walking tree basically, who walks around saying only one sentence: I am Groot. 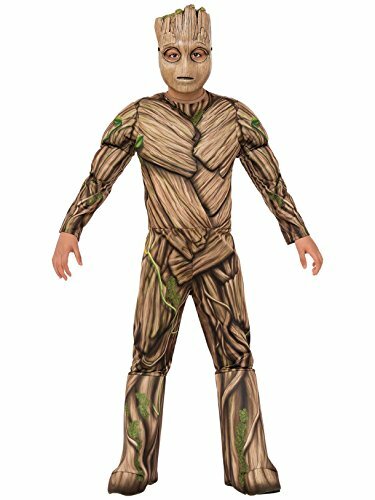 Most of the Groot costumes are very simple. They’re jumpsuits with wooden textures. However, if you spend a little more money, you can find 3D detailed ones that will make you the success of the Halloween party you’re going to this year. Rocket Raccoon is a talking raccoon who wears a space jumpsuit. 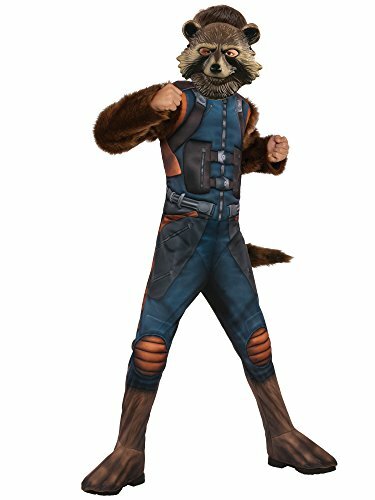 The Rocket costumes come with furry masks and hands along with the space suit. It’s also very easy to find inflatable versions of the space gun that Rocket uses in the movies. 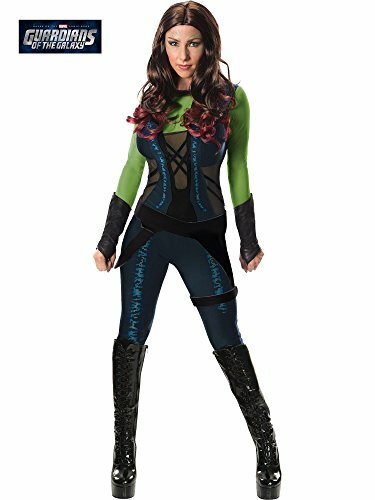 Among girls, one of the favorite characters to dress up as, is Gamora. She’s an alien with green skin, brown and purple hair who wears an all leather black jumpsuit with black leather boots. As you can see, you have a lot of options when it comes to choosing one of the Guardians of the Galaxy costumes. Because of the different characters available, it’s also a great option when you’re looking for group costume ideas. When you decide to go with one of these, I’d love to see your pictures. Feel free to share below!